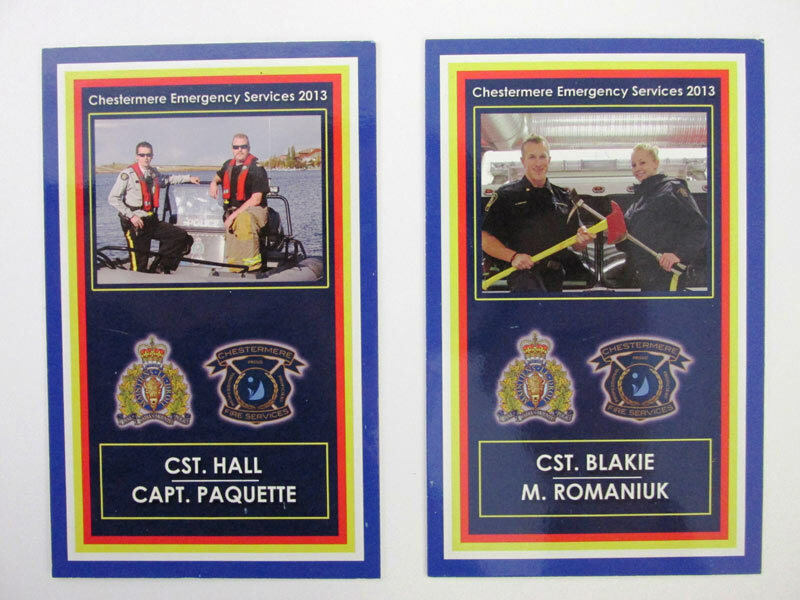 The Chestermere RCMP, in partnership with the Chestermere Fire Service, have begun the ‘Emergency Services Card’ collection contest. This is the second time this event has been held with the initial competition in 2011 being an overwhelming success. The contest provides an opportunity for the community’s youth to interact with and to get to know the town’s emergency responders in non-emergency situations. It is open to students in Grades 3 to Grade 6 at the participating schools in Chestermere. The students are encouraged to approach and politely request the individual emergency services cards from the many fire and police members stationed in Chestermere. There are a total of thirteen collector cards in the 2013 edition. At the end of the contest, the children that have collected the specified number of cards based on their schools criteria will be entered in a draw at their school. The prizes will include some fun Nintendo 3DS gaming systems. Cards can be collected at the schools during emergency responder visits and anywhere in the community where responders are present. Cards will not be issued at the RCMP Detachment, the Chestermere Fire Hall or when responders are actively busy in emergency situations. As the purpose of the contest is to encourage interaction between the youth and the emergency responders; we request that the youth collect their own cards without the assistance of parents and guardians. They are further encouraged to trade amongst themselves for cards they currently do not have. The Chestermere RCMP and Chestermere Fire Service thank the Town of Chestermere for their encouragement and financial assistance to make this contest possible.